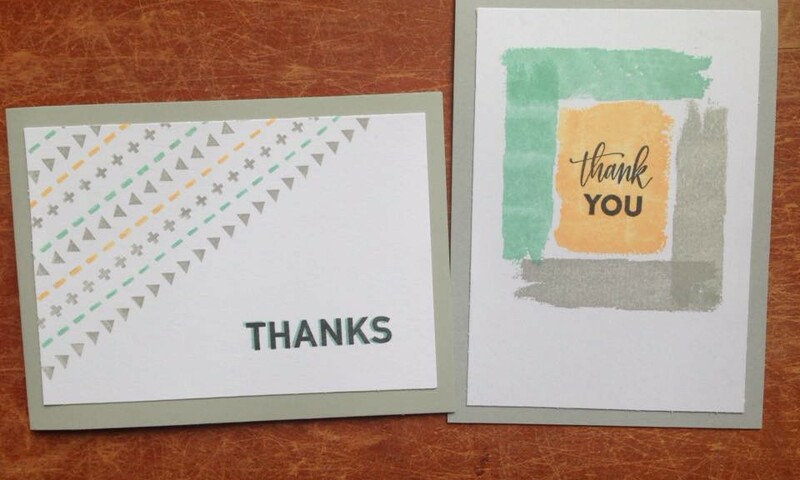 January is Thank You card month at my house. I thought I had enough Thank You cards, but I was wrong. I drew inspiration from the current Lawn Fawnatics Challenge. Extra Details: I started with a panel of white card stock. I used Forget Me Not Lawn Fawn Ink and an ink blender brush to blend on the sky. I stamped the clouds using Let’s Bokeh stamp set. I used Ballet Slippers, Butter, Moonstone, and Manatee ink. I cut out the clouds using fine tip scissors. 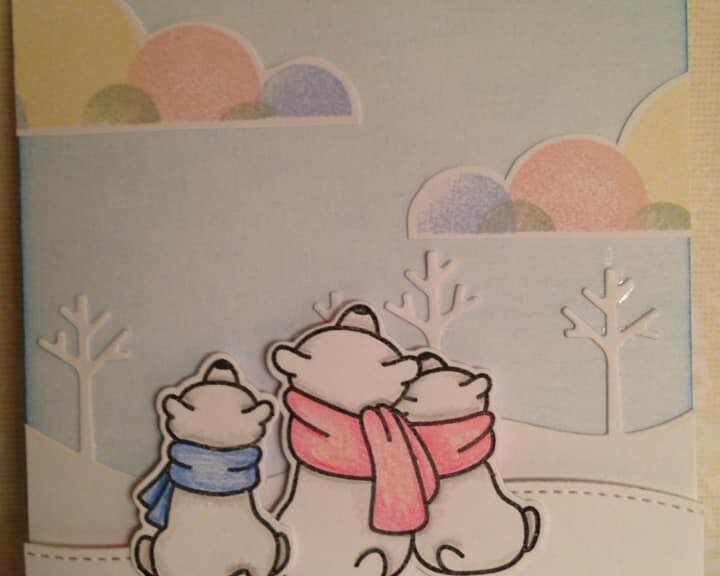 I colored the bears in Primsa Color pencils and cut them out using the coordinating dies. I also cut out a stitched tree border and a hill side border. 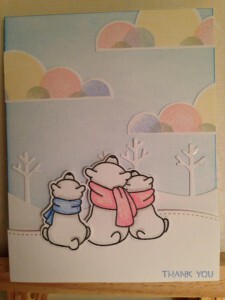 I layered the clouds and the tree border flat to the card panel. I popped up the hillside border and bears. Lastly, I added the sentiment in Moonstone ink. It has been far too long since I have blogged. My New Year’s Resolution this year is to get back to blogging more often. 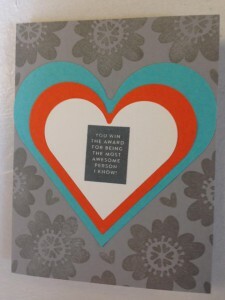 I have a whole ton of cards waiting to be added to the blog and so many ideas for new cards. 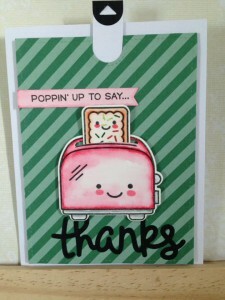 This card design is the one I used for my thank you cards this year. I got the Lawn Fawn Let’s Toast set for Christmas and couldn’t wait to play with it. 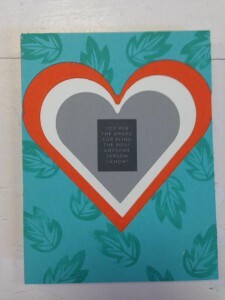 Extra Details: I die cut a small rectangle from some green patterned paper and adhered it to a white card base. 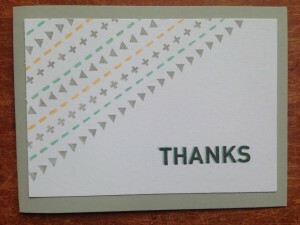 From black cardstock, I die cut the word thanks and then adhered it to the card base also. 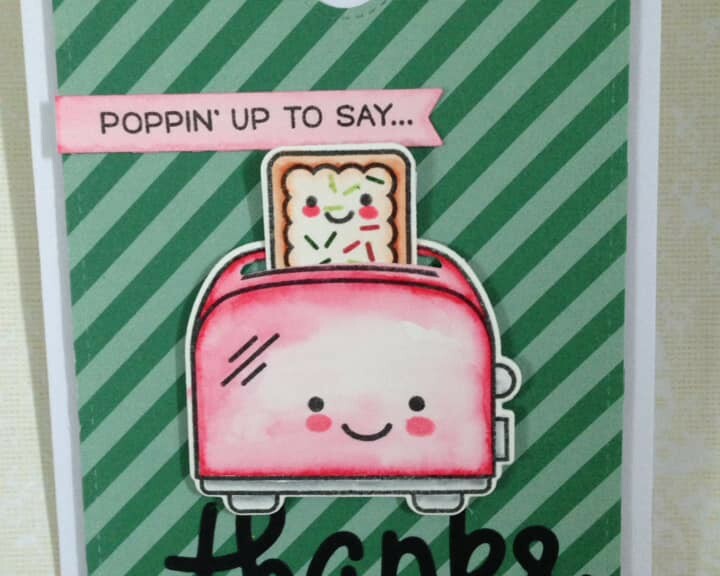 I stamped the toaster and pop tarts on some water color paper. I used my Crayola Fine Line markers to water color the images. The coordinating dies made cutting out the images super easy. 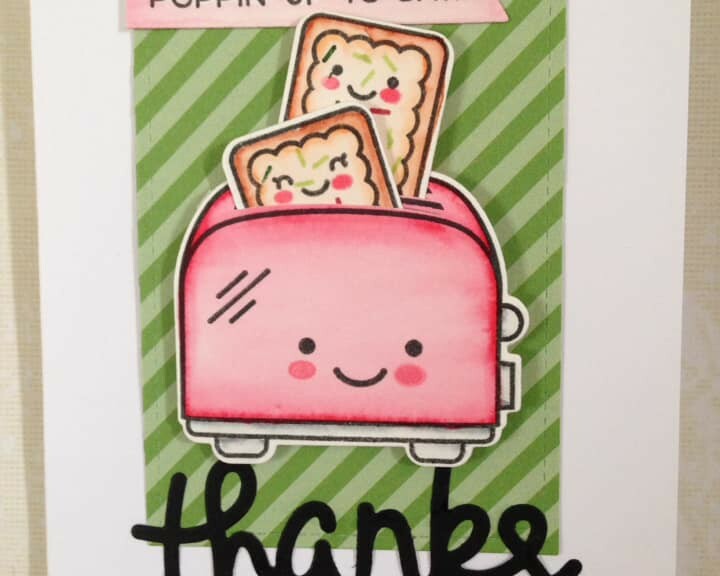 I added some sprinkles to the pop tarts for added color. 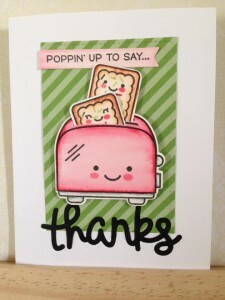 Then, I layered the pop tarts and toaster together. I used foam tape to give the images some dimension on the card front. In the end, I made 36 of these cards. This is a thank you card I made for a co worker of mine. She put together the most amazing Nature Day activities for our school. 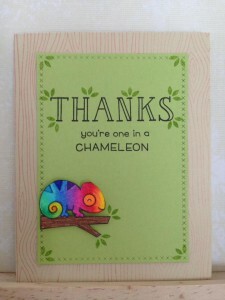 Extra Details: I began this card by stamping and coloring the chameleon and branch. I used Primascolor pencils. 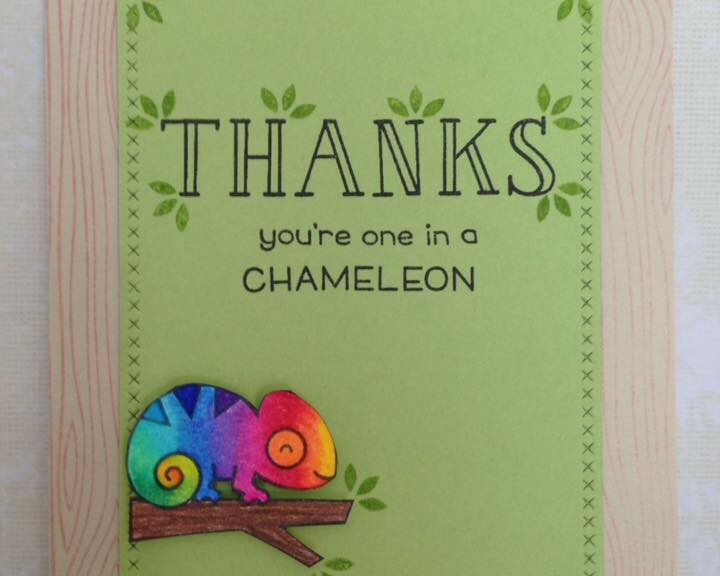 I love the way my rainbow chameleon turned out. I fussy cut out the images and painted the edges with a black marker to hide any cutting errors. I die cut a panel form some green card stock. 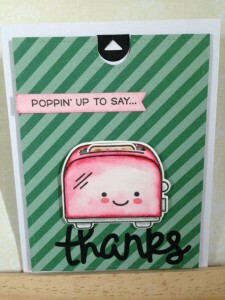 I stamped a sentiment on the top area of the green panel I black ink. I added some green leaves around the sentiment and corners. I adhered the branch and chameleon with foam tape and added some more leaves. Next, I prepared my card base. I used a tan card stock. I added a wood grain design with a stamp and some rose gold ink. Lastly, I adhered the green panel to the green panel and the card was finished. Who doesn’t love getting a new stamp set in the mail? 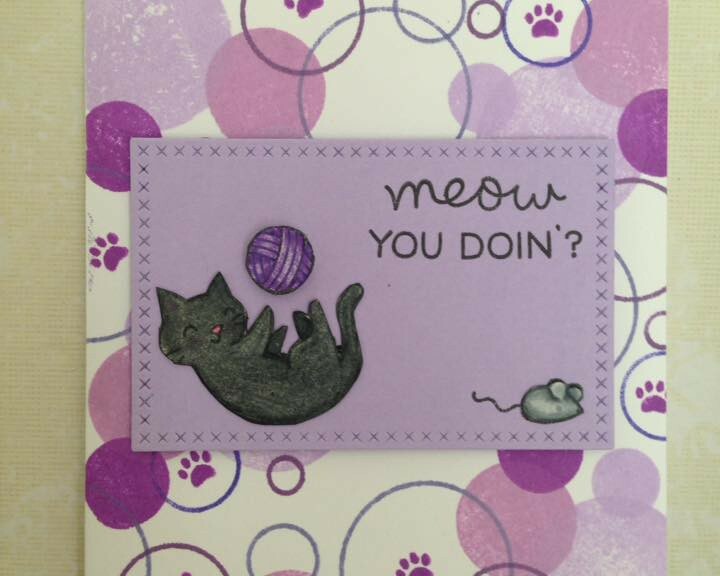 I just bought Lawn Fawn’s Meow You Doin’ and had to play with it. This is the card I made. Extra Details: I began by stamping the car and accessories on some white card stock. I used Prismacolor pencils to color everything in. I fussy cut them out right on the black stamp line. I painted the edges black with a marker to hide any cutting errors. I used liquid glue and some foam tape to adhere the images to a small rectangle of Simon Says Stamp Lavender card stock. I stamped the sentiment in the top right corner in black ink. I prepared a white card base. I used the Lawn Fawn’s Let’s Bokeh stamp set to create a fun back ground. I used six different purple inks for the stamping. I added some paw prints also. Lastly, I adhered the purple rectangle with foam tape and the card was finished. 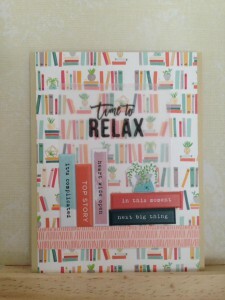 As soon as I got my hands on the Simon Says Stamp May 2018 Card, I knew I had to make some cards using the book paper. My grandmother loves to read and receive handmade cards. I used some of the stickers and one other piece of pattern paper from the kit also. Extra Details: I began these cards by cutting the pattern paper into 5.5 inch by 4 inch strips. I saved the pieces I trimmed off as well. I also die cut a small stitched rectangle and stitched circle from some velum. 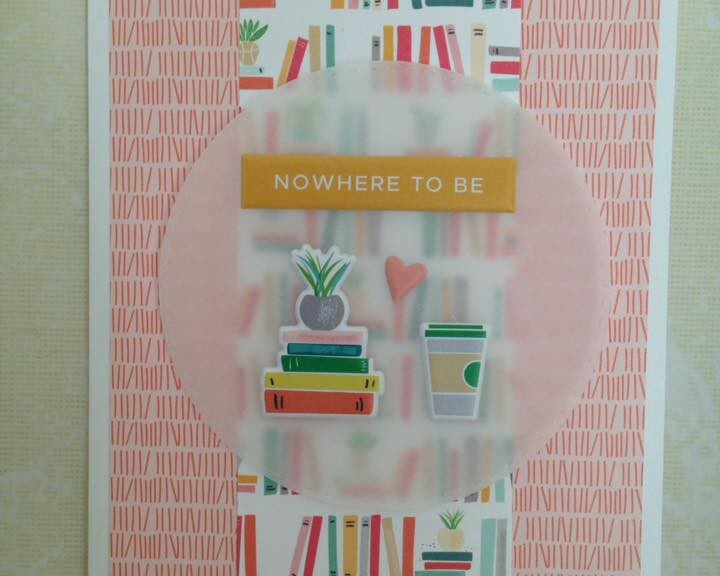 For card two, I adhered the orange one to a white card base. I layered the 2 by 5.5 inch strip of book paper down the middle. I added some stickers to the velum circle. I hid some foam tape behind the stickers to adhere the velum circle to the card front. A friend of mine asked me to make him a set of 15 Thank You cards. I couldn’t settle on one design so I made two. I used the same colors on both designs so that the cards feel like they belong together. Extra Details: I began each card by creating the grey card bases. I could only find 12 by 12 grey card stock in my local craft store. So I made 4 inch strips to get the most card bases possible. I scored and folded my card bases. Using some smooth white card stock, I cut a 3.5 by 5 inch panel for the front of each card. 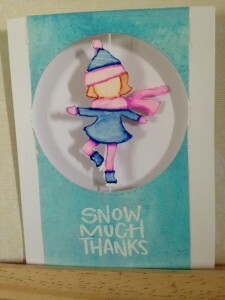 For the first design, I used Simon Says Stamp’s Brushstroke Messages stamp set. 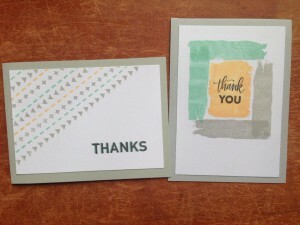 I stamped the large square-ish stamp in Simon Says Stamp’s Melon Hybrid ink. 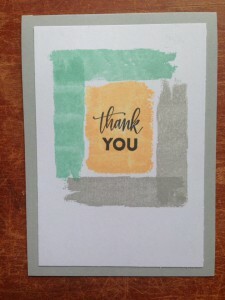 I added the Thank You sentiment in black ink right in the middle of the orange block. I added a frame using Simon Says Stamp’s Spring Rain Hybrid Ink and Smoke Ink. I adhered the panels to the front of a grey card base. In the end I made 8 of these cards. I think this is my favorite of the two designs. 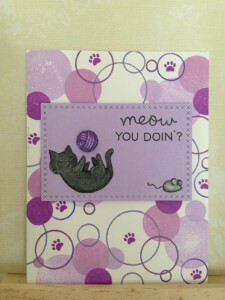 For the second design, I used Simon Says Stamp’s You + Me Stamp set. 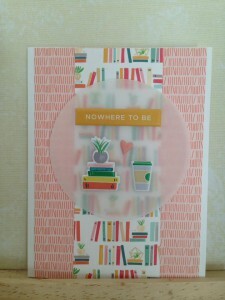 I used the borders to create a design in the top left corner using Simon Says Stamp’s Melon and Spring Rain Hybrid Inks. The grey ink is Simon Says Stamp’s Smoke. I stamped the bold Thanks in black ink. I then moved the stamp slightly to the left and stamp it again in the Spring Rain Hybrid ink to give the word a blue shadow. I think the shadow effect really made the design. I adhered the panels to the rest of the grey card bases. In the end, I made 7 cards with this design. Lastly, I added a white liner to the inside of each card base. Simon Says Stamp’s Smoke Ink. I made this get well card for a student in my class. All the students and teachers signed it and mailed it to her. 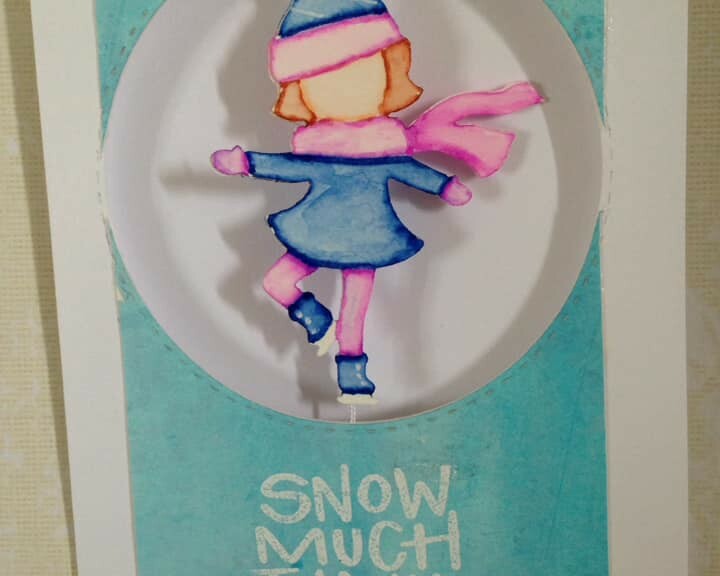 Extra Details: I began this card by making a card base from some white card stock. I created a black panel for the front of my card that measured 3.5“ by 7”. I adhered this to the front of the card base. 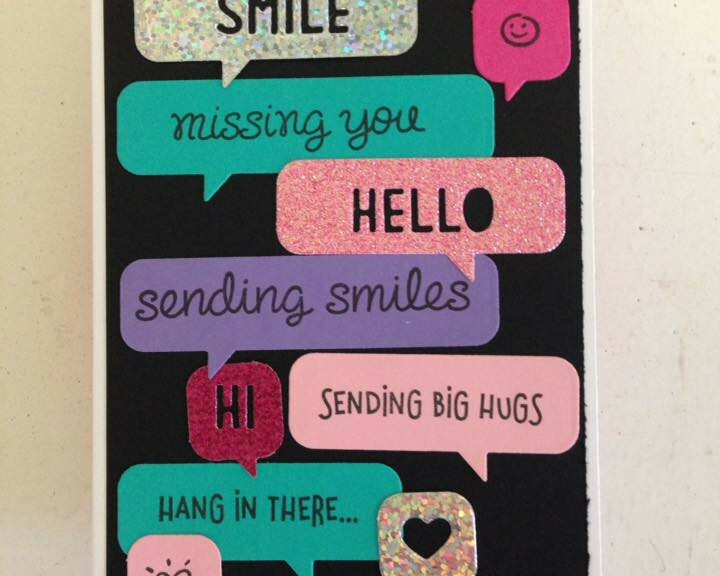 I die cut the speech bubbles from some glitter paper, holographic paper, and colored card stock. On the specialty papers, I die cut the sentiments as well. 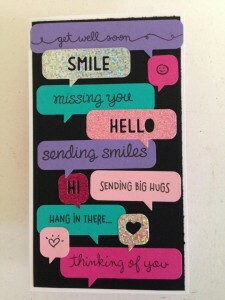 I stamped sentiments on the card stock speech bubbles in black ink. 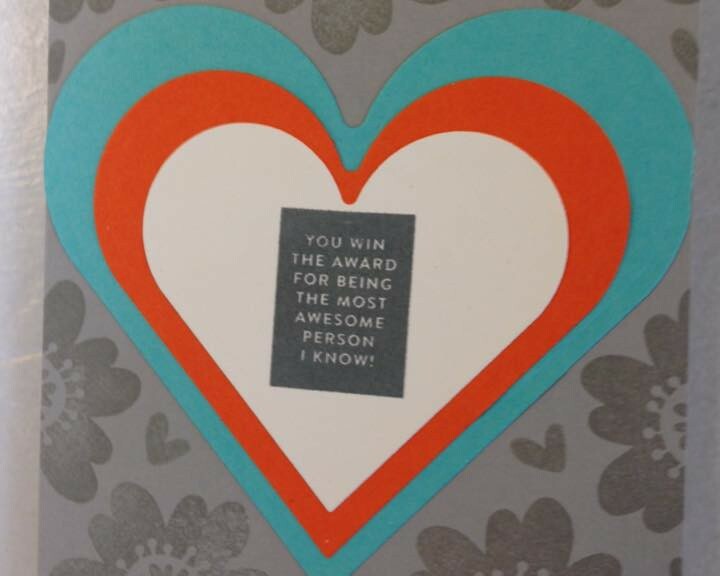 Lastly, I adhered the speech bubbles to the front of the card. I really like the way this card turned out.